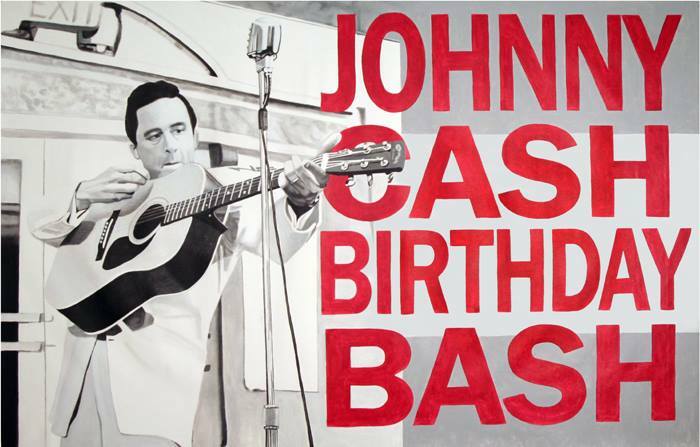 The Johnny Cash 83rd Birthday Bash returns to The Bell House on March 6, 7, & 8, 2015. A Brooklyn tradition since 2005, all shows feature Alex Battles & The Whisky Rebellion performing dozens of Cash favorites such as “I Walk The Line,” “Folsom Prison Blues,” “Big River,” “Jackson,” “I Still Miss Someone,” “A Boy Named Sue,” and many more, duets with crowd favorite Linda Hill, Carter Family songs performed by The Calamity Janes, painted backdrops by LJ Lindhurst, and classic country from DJ General Buell. This year’s three-day installment adds the first-ever Sunday afternoon all-ages Johnny Cash Birthday Bash commencing with hymn sing of Cash’s favorite spirituals from album “My Mother’s Hymn Book” followed by Kristin Andreassen calling square dances with The Calamity Janes and Alex Battles & The Whisky Rebellion performing dozens of Johnny Cash songs. Sunday, March 8, 2015 – All Ages! A limited number of two-night passes for Friday and Saturday night’s shows are also available. What is your favorite Johnny Cash song? Let us know in the comments!